If you could pay $100 now for an additional $1.4 million down the line, would you do it? According to the National Association of Colleges and Employers, the average median income for English majors is $35,000 per year. That’s higher than many teachers and adjunct faculty make, by the way. But it’s nowhere near the potential of an English degree. As proof, let’s compare that figure with my personal experience – one that I’ve had because of the information I share in this guide. My first post-graduation salary job paid $70,000 per year – that’s literally double the annual median income for English majors of $35,000. Over the course of a 40-year career, that extra $35,000 per year translates to an additional $1.4 million in earning – not too shabby! By continuing to use this approach, I was earning over earning over $100,000 per year just 18 months after graduation – all with a “simple” English degree. Let’s look at some more numbers. Say the person making $35,000 per year gets a 3% raise annually. After two years, that puts that person’s income at $37,132. Now, let’s compare that $37,132 with $100,000 – my income two years after graduation. Within two years after graduation, the information in this guide has already earned me an additional $62,868.00. 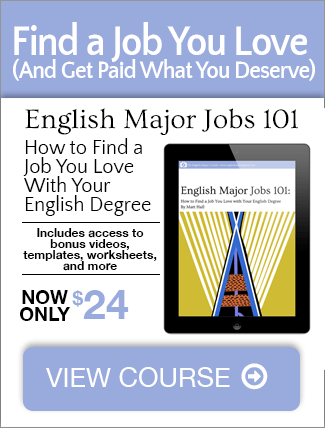 Look, I’m not promising the information in English Major Jobs 101 will make you a millionaire. But I do promise that if you follow it, the approach this guide explains will accelerate your career and boost your lifetime earnings.